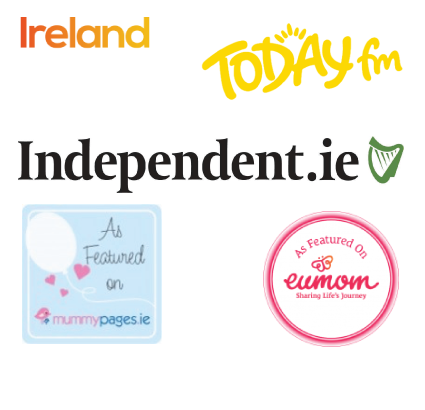 Earlier this month I was interviewed by Kelly from Upstarts.ie on Dublin City FM to discuss the importance of making a Will. 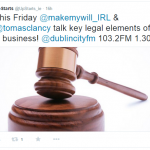 Also on the show was Tomas Clancy, Law Lecturer with Independent Colleges Dublin. The Upstarts radio show is a showcase for new and innovative businesses and Kelly asked me to join them to discuss www.makemywill.ie and how I came to establish MakeMyWill Solicitors. If you are thinking about making your Will, or updating your Will, this interview is well worth a listen. * I have recently teamed up with the Irish Cancer Society in an effort to promote leaving a gift in your Will to charity. Many of my clients believe a charity would expect a large chunk of their Estate if they mention a charity in their Will. There are not many of us who have a property or a Monet painting to leave to charity, and I have often heard clients say “charity begins at home”. Of course you should look after your loved ones first and foremost. However, what many people don’t realise is that charities are delighted to receive any amounts, big or small. For example, if you leave a gift of €1,000.00 to the Irish Cancer Society, this provides cancer support and information to 50 people through their helpline or website. €3,500.00 provides 10 nights of Night Nursing Care to a patient who wishes to die in the comfort of their own home. If just 5 people each left a sum of €750.00 in their Will, it is enough to provide this 10 nights’ Night Nursing Care. I can assure you, your beneficiaries won’t miss €750.00 from your Estate, and you would be helping a very worthy cause. For more information on this, please get in touch with me.